Did you know that there was an episode of Famicom Dojo before there was a Famicom Dojo? Not just the one released on Zac Shipley’s channel, but one we never released for public consumption? Sure you didn’t! We know lots of stuff from back in 2006. 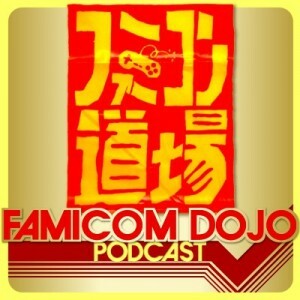 Learn more from Vinnk and Sean as they talk about their memories of Famicom Dojo before there was a Famicom Dojo, how the name was chosen, and the revelation that even the first episodes took a super-long time to create! Oh, and we explain a bit more about our plans for the future of Famicom Dojo in 2013 and beyond. Hi, kids! It’s TGS time again, but this time will see a return of yours truly (Sean “TheOrange” Corse) and Famicom Dojo‘s Kevin “Vinnk” Tambornino to the hallowed halls in Makurahi Messe — the first since 2007! Vinnk and I will be reporting straight from the show floor all week, so keep your eyes fixed on this spot. (It should be available in the sidebar, at least while the show is going on.) If you’ve been following Powet.TV’s convention coverage lately, you can expect much of the same: daily video blogs, skits, short news clips, and written reviews of our experiences at the show. 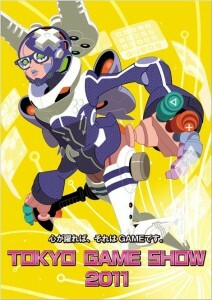 Check out a digest of this year’s show after the jump, as well as our Tokyo Game Show coverage from 2007! There is a “Train Your Game” Famicom Dojo panel on Saturday from 3-4pm where I’ll be going over some 8-bit tips and tricks including why Pols Voice hate loud noises, and the science of the Minus World. Until then, here’s a reminder to keep it clean! Game blog Kotaku caught our globe-trotting reporter SeanOrange unawares. Luke Plunkett snapped this photo. To be fair, the time difference from the states to Japan is pretty big. Its the middle of the night when this picture was taken. 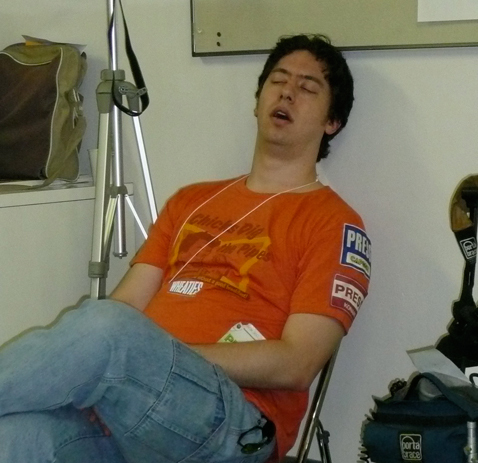 I’m sure when he awakens from his slumber, he’ll have loads of gaming news for us all. In the mean time, some shut eye.